Mobile Home Parks: Is This Undiscovered Real Estate Investment Right For You? 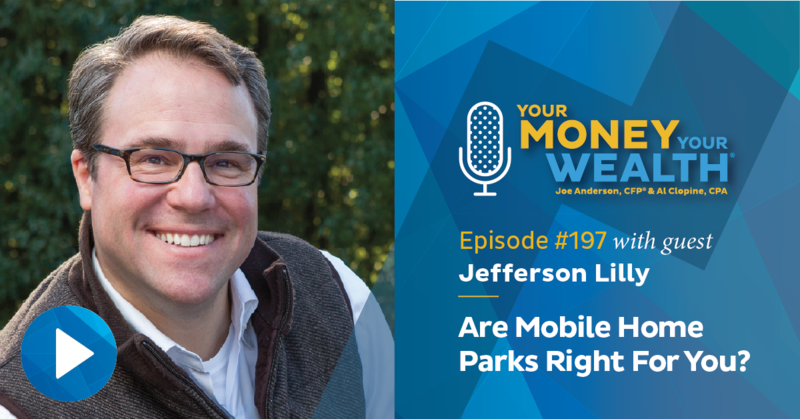 Jefferson Lilly from Park Avenue Partners and the Mobile Home Park Investors podcast and LinkedIn group tells us why he thinks mobile home parks are the best real estate investment available. Plus, Joe and Big Al answer a whole slew of your money questions: what percentage of natural resources should be in your portfolio? How and where should you invest $50,000 in cash? How should you plan for retirement in the event your pension disappears? What should your TSP allocation be if you’re planning to retire in 20 years? And finally, can you transfer your 401(k) into your spouse’s solo 401(k)? (21:41) What Percentage of Natural Resources Should be in Your Portfolio? (24:57) How to Invest $50,000 in Cash? (32:50) What Should Your TSP Allocation be if You’re Retiring in 20 Years? (36:18) Can You Transfer Your 401(k) to Your Spouse’s Solo 401(k)? I don’t know about you but I’ve had turkey leftovers for 5 days in a row now. Luckily, we’ve got the perfect podcast to listen to while you walk or jog off the last of the Thanksgiving food fest! I’m producer Andi Last, and today on Your Money, Your Wealth®, Jefferson Lilly from Park Avenue Partners and the Mobile Home Park Investors podcast and LinkedIn group tells us why he thinks mobile home parks are the best real estate investment available. Plus, Joe and Big Al answer a whole slew of your money questions: what percentage of natural resources should be in your portfolio? How and where should you invest $50,000 in cash? How should you plan for retirement in the event your pension disappears? What should your TSP allocation be if you’re planning to retire in 20 years? And finally, can you transfer your 401(k) into your spouse’s solo 401(k)? But first, here to kick things off with me are Big Al Clopine, CPA, our guest Jefferson Lilly, and Joe Anderson, CFP®. JA: So Jefferson, tell me your story, my friend. I would like to know how I can get in the mobile home park business and make millions. JL: (laughs) Well Joe, as I say, when I woke up from the concussion, it just seemed like a good idea to buy a mobile home park. (laughs) I got into the business about 11 years ago. Initially, I thought I wanted to diversify out of the stock market, I wanted to buy – probably initially I was thinking about buying an apartment building, and ended up doing some online research and kept finding mobile home parks were this quirky little niche of multi-family that yielded a lot more money than regular apartment buildings. So I did some research and basically figured out why this is a much more interesting niche than traditional multi-family investing and bought my first park, and another park, and have now grown up and, with some others, we’ve raised some money and we bought about two dozen parks nationwide. JA: Tell me a little bit more about the process. You’re doing research, you find out that mobile parks are more profitable or give you a higher cap rate than let’s say an apartment building, and I’m imagining that has to do with risk. Tell me the structure. I mean, if I were to do this, do I buy land and then people put their own mobile homes on my land and I charge them rent? How does all this stuff work? JL: Well, good questions. We don’t actually develop mobile home parks. We would much rather buy the cash flows in place. So we’re typically buying parks that have been built somewhere back after the war, the 50s, 60s, sometimes into the 70s. And again, we typically purchase them with let’s just say 80, even 90% already full with folks that own their own homes. So that means the cash is flowing, as it were. If we were to develop a park, first, that’s very, very difficult to do. That’s one of the things that makes this such a quirky niche and so profitable is the government regulation. So it’s generally not possible to build mobile home parks anymore. Pretty much every city and county has outlawed that over about the last 30 years. So you tend to buy parks in place. And, again maybe they are 10% vacant, maybe 20. And then at the margin, we can buy new or used homes, bring those in. Our goal is always to make a good return for our investors and also to expand the supply of affordable housing. So we’re a for-profit, but we’ve also very much got a social mission with what we do. So we’re in-filling that last little bit. But it’s usually already been fully constructed. Those pads are just sitting there vacant. And again we’re buying new or used homes, bringing them in, putting them on those pads, and opening them up to new lower income families. JA: So I go to the mobile home park, so do I own the mobile home, but you own the land that my mobile home is sitting on is I guess my question? JL: Yes. So that puts me as a landlord in a pretty good position. I’ve got a responsible tenant, they do own, almost all of them, do own that mobile home. If you’re making $30,000, $35,000 a year income, this is your path forward to homeownership – at least for now and you can always trade up later. But yeah, by and large, the folks own their homes and therefore all of those proverbial leaky toilets and leaky roofs are on – the maintenance of the homes – is on them, they’re the homeowner. I just collect the lot rent into the ground. So basically, this business is a lot like the parking lot business, except we have mobile homes instead of cars, and they’re much more permanent. JA: Almost like self-storage too I would imagine. JL: Well somewhat – that’s another very good business, if I couldn’t be in the mobile home park business I’d probably be in self-storage. But the issue with self-storage is there you do have some real estate to improve and maintain. There are bricks and mortar there. Whereas again, we generally just are buying parks with roads and some pipes in the ground, the water, and the sewer, but that’s it. We have many parks where we literally don’t own anything that sticks up out of the ground. Many of our parks, again, are more affordable, maybe an average lot rent of 300 bucks, but that means typically there isn’t even a clubhouse or a pool tennis courts. Those tend to be much higher end mobile home parks that would have those sorts of improvements. So yeah, often we just literally own some of the improvements that are right on the surface of the land or below it, and anything else that sticks up out of the land, we don’t have to maintain, those mobile homes are owned by the residents. Again, that makes them a much more responsible tenant than say, a typical apartment building renter. We’ve got tenants that have really an owner’s mentality, which is way better than, again, investing in an apartment building where you have traditional and proverbial renters that damage places and turn over every couple of years. Our tenants, because they own those homes, and although they’re called mobile, they really aren’t. Again, these are mobile homes, not RVs. There’s no engine in them. They get tied down to the ground permanently. Our tenants tend to stick around for a decade or more, so we’ve got lower maintenance and lower turnover than apartment buildings, and as I mentioned earlier it’s illegal to really build any new parks. JA: Why is that? Well you know, if you’re a local city or county alderman or whatever those folks’ titles are, if you’ve got the skills and interest to run in a local election and get elected, honestly, you’re probably at least middle class or upper middle class. There are very few people that get elected to city councils that live in mobile home parks. So, unfortunately, a lot of folks that live in single family houses look down on people that live in mobile homes. There have been a couple of studies done showing that, in fact, mobile home parks do not have higher crime rates than their surrounding neighborhoods. So I think it’s unfortunate and it’s largely an undeserved reputation. JA: Aren’t there a lot of retirement communities, like Apache Junction – I think my aunt lived there in Arizona. Do you own that one, Jefferson? JL: I don’t. Not yet. Give it give me the name and number of the owner, I’ll give them a call. But yes, there are retirement communities obviously in the Sunbelt, a lot in Arizona, more in Florida, that is probably, I would guess 5% of all the market, 10 at the most. So the overwhelming majority of mobile home parks are what we call all-ages. So there may well be seniors in them. The first park I ever bought was probably a third or more seniors and still is, but officially designated seniors communities, again, are a fairly small percent of the total market out there of parks. AL: Okay, I’ve got a question. I’m a complete novice. I know nothing about real estate investing. But I do know that occupancy is a big deal. So how does that work in terms of a mobile home park as opposed to traditional real estate investing? JL: Right. So we of course look, we’ll research the occupancy before we buy a park. We’ll then market it two ways. We do market that we have, usually, empty pads, and we’ll even often pay to move a mobile home in. As I mentioned, it is expensive to move these, let’s just say roughly $6,000 for both the move and then getting the new skirting put on the house and the new pipes all connected. So we’ll often pay at least half, sometimes all of that, to anybody that owns their own home and wants to bring it in. But honestly, not very many people move, even when you pay for the move. So we then, again, will buy and bring in either new or used mobile homes and we’ll often finance those. So we advertise those on places like Craigslist and Zillow, and then we’ll be able to provide somebody a house, generally say a three bedroom house, roughly 1200 square feet – a three bedroom, two bath house probably, for $2,000 down, maybe $3,000, and maybe their total payments would be say $650 maybe $700 a month. And in most of our markets, folks would have otherwise been living in an apartment building with only say a two bedroom apartment for probably closer to $900 in most of our markets. So again, we’re able to get folks on a path to home ownership for less money than living in an apartment building. JA: So how do you make your money? Is it them renting out just the land, or are you now saying, hey, I’m buying some of these homes and then selling them to other individuals that you want to fill your occupancy up? JL: Yeah, so we’ll do both. Where I am now at Park Avenue Partners, we’ll actually buy homes, finance them for tenants, we’ll own them often outright, and put them on a rent-to-own agreement. But we do also work with a couple of large lenders that will actually own and finance house, that means we don’t ever really have to take title to that house. They’ll move in a mobile home and we’ll work with them to find someone qualified that will move into the house and then that person pays their mortgage to that bank and they pay us the lot rent. So yes, we make money principally by collecting lot rent. I’m guessing that’s probably about 90% of our revenue. The remaining 10 would be from financing houses. And then we pay the local manager, we pay the property taxes, we maintain the roads and those pipes in the ground. And when all is said and done, usually there’s still a profit for us. That’s how we make our money. JA: When you look at it, it sounds that lot rent isn’t all that expensive, but it sounds like it has to be a lot of lots for this to make sense. And if you’re saying that mobile home parks have provided a better rate of return or better investment than a normal real estate deal, how is that? I mean, there has to be then, what, more risk involved in mobile parks, or…? JL: Well I don’t view it that way. Most people don’t. I know all the business school professors and all the fancy Ivy League schools are always preaching that markets are perfectly efficient and you couldn’t possibly ever have a higher return for lower risk. But my investment thesis is that this niche is just that, at least for now. It may be different, maybe it all gets discovered in another five or ten years, and maybe the rates are reduced at that point. But right now, this is still a very small niche. So to put it in perspective I would guess that the traditional multi-family market, that is apartment buildings, is probably at least 100 times larger. So not everybody is talking about this niche. You know, they’re talking about the latest apartment deal they just got in on. So this is largely undiscovered. It’s just really small and because it’s so small, Wall Street can’t really shove a billion dollars a year at it. Most of us that are going after this niche, we’re raising a couple million a year to go do this thing. Maybe $10 million. This isn’t a large niche, so it’s largely undiscovered. And it is still, in my view, still quite inefficient. JA: And so when you’re buying these parks, then are you giving them a discount? JL: Well, who’s to say exactly what a discount is or what they “should” go for. We’re often buying parks at say an 8 cap or a 9 cap. So that means that if we were to buy it without any debt, we’d make 8 or 9% on our money. We do tend to buy with debt and then leverage moves our returns usually up into the 13 to 15% range. But certainly apartment buildings often will go for like a 5 or 6 cap, and that’s what your cost of capital is so borrowing to pay that much for an apartment building means it’s very difficult to get a good return. I think in today’s market a lot of apartment buildings might only return 7 or 8% cash-on-cash and that’s more like half of what we’d get for some of our deals in this niche. JA: A lot of our listeners are looking for passive income. So if you’re looking at an 8% cap rate, that’s pretty good cash-on-cash return. Let’s say if Andi and I want to go out and buy a mobile park. What do they run? I mean I’m sure there’s a full gamut of ’em but on average? JL: Yeah. My best guess is that the average mobile home park in America probably goes for let’s say three-quarters of a million bucks. The range, I mean theoretically any single piece of land with two mobile homes on it would technically be a park. Something like that in a not good market might be a $20,000 or $30,000 expense, and then some of the very nice parks right on the water have easily gone for $30 million to $50 million. AL: What’s an average number of lots on a mobile home park? JA: So what I gather of what you’re doing is, “let’s get some investors involved. Let’s get a pool of capital, go out, buy some of these mobile parks, use some leverage.” Am I saying that right? JA: How much leverage would you say on average that you’re using within your fund? JL: Right around 72%. We always ask for 75, which is usually the max that a bank or the CMBS market will go – or the agencies, we also borrow from Fannie and Freddie to finance these. But we typically get scaled, maybe half the time we get scaled back more towards 70. So I believe 72% loan-to-value is where we go in, and then we’ll raise rents, as I mentioned, we’ll buy and bring in homes. So pretty quickly, we think we’ve improved the value and the debt service coverage ratio sometimes even towards 2.0, which basically means for every dollar in profit and cash flow, we only have to pay out 50 cents to the bank. So that gives us quite a good cushion if something bad happens, we can still afford to lose a bit and still certainly make our bank payments. JA: So what happened with some of these parks in the recession in ’08 when real estate kind of collapsed and everything else, residential real estate blew up. Commercial real estate kind of blew up, how did mobile parks do? JL: We did surprisingly well. So I had just bought my first park in March of 2007. So that was probably to the month and maybe to the week, the very end of the easy money and the high prices and by that summer and certainly into early ’08, the wheels began to come off the housing market. Now, I will mention that something like 80% of all the site-built house mortgage defaults were in, I believe, 20 zip codes. So this was a very focused bubble bursting in L.A., in Las Vegas, I think Phoenix, and the Miami area, there were some very concentrated areas where everything blew up. But my first part was in Oklahoma and there were very, very few defaults there. Housing prices actually continued to increase ’07, ’08, ’09 into ’10, Oklahoma didn’t have a down year. The growth slowed but the housing market just moved along just fine in places like Oklahoma and in fact, in most of the country. So my rents were up approximately 50% from ’07-’09. That first part had really low rents of just about $110 a month and I raised them I believe to $155 over those first couple of years. Still pretty low but I didn’t lose tenants – I stayed 95 to 100% full right through the whole housing debacle. Even other park owners that I know closer into places like Vegas and Florida where there was a much greater bloodbath, they had somewhat higher tenant turnover, but even they stayed full. So this is really a fairly recession resistant niche. JA: If someone wanted to do this on their own Jefferson, what advice would you give them, or what resources would you help them with? Because you’ve been extremely successful doing this, you have your own company, you have investors, and you’re building one way. Another way is to be doing it on my own. What advice would you give our listeners in that circumstance? JL: Well, I’d encourage them to listen to my podcast. I actually started the industry’s first podcast just dedicated to investing in this niche. It’s simply called Mobile Home Park investors and they can also just find it off the website MobileHomeParkInvestors.com – that will link them right through to iTunes or Stitcher. I’ve done 112 or 113 podcasts. I try and get one out about every other week. But I think folks can learn a lot, I’ve been getting something like 16,000 downloads a month from people learning about the business and downloading my podcasts. So I think that would be a pretty good place to start. And I do answer questions if folks want to reach out to me as well. JA: Jefferson, this was fantastic. I’ve learned quite a bit about investing in mobile parks. AL: Me too. So Joe, are we’re going to go in together and buy one? JA: I think so. I think I’m going to listen to Jefferson’s podcast. I’m going to take some notes, I might write him, ask him a few questions, and then yeah, then we’re going to go to Oklahoma and start scoping some stuff out. (laughs) Or maybe Apache Junction where my Aunt used to live. We’re talking with Jefferson Lily from Park Avenue Partners. Jefferson, I really appreciate you taking the time. Thank you so much. JL: OK thank you, Joe and Andi. Be well. Find links to Jefferson Lilly’s Mobile Home Park Investors podcast and LinkedIn group in the show notes at YourMoneyYourWealth.com. Remember, this show does not intend to provide personalized investment advice through this broadcast and does not represent that the investments, securities or services discussed are suitable for any investor. Investors are advised not to rely on any information contained in the broadcast in the process of making a full and informed investment decision. No, that doesn’t mean we’re done! It’s time to open the email inbox and answer your money questions. Add your question, comment or suggestion to the list: email info@purefinancial.com, click the “Ask Joe & Big Al” button at YourMoneyYourWealth.com, call (888) 994-6257, or post your question on our Facebook or Twitter pages and the fellas will answer on the podcast. Find our social links in the show notes at YourMoneyYourWeatlh.com! 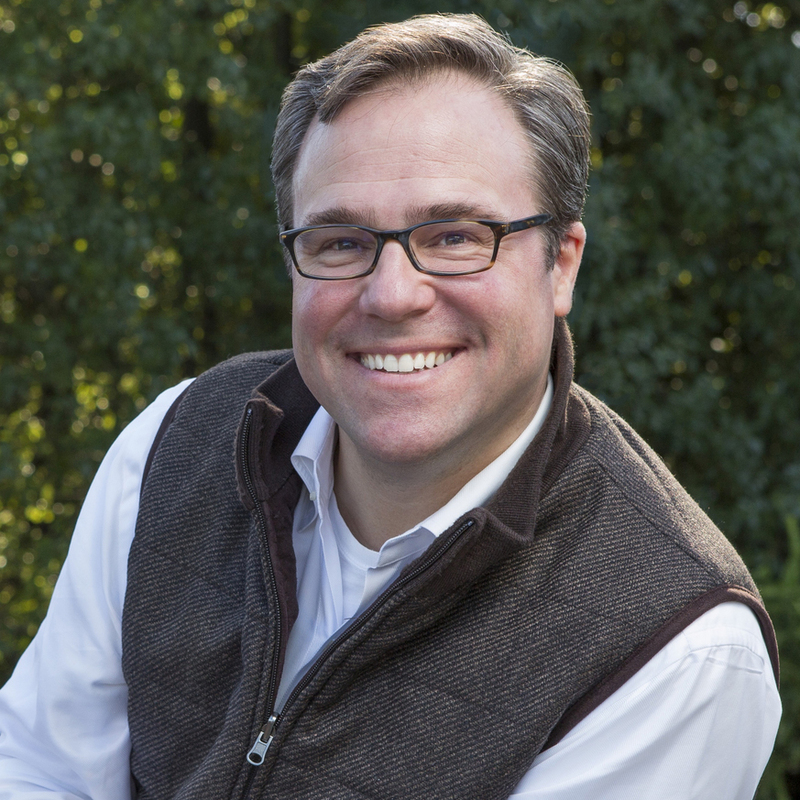 21:41 – What Percentage of Natural Resources Should be in Your Portfolio? JA: We’ve got Nick from Moreno Valley, California. Is that right, Moreno Valley? Have you ever been to Moreno Valley? AC: I’ve driven through it. AL: I don’t even know where it is. AC: It’s on the way to Palm Springs. JA: Got it. So Nick writes in, “what do you think of natural resources and exponential technology as part of a diversified portfolio and in what percent? Thanks, Nick.” All right. Well, I could take a stab at that. Exponential technology, he must listen to our good buddy Ric Edelman. AC: That’s what I’m thinking too. And by the way, there is actually a fund or two that invest in specifically that. JA: Yes. And those are all publicly traded companies. Well, I guess I’ll take a stab at both of these. I think yes, if you look at natural resources, do we believe that there should be a part of your portfolio? The answer is yes. Natural resources could be all sorts of things. But what percentage would you want to have in your overall portfolio? AC: Well that’s always a good question and I guess I would answer it by saying not too much. JA: You don’t want timber? Oil? Natural gas? Gold? Silver? Platinum? AC: Yeah, I was going to say under five. So I guess we’re consistent. JA: Yeah, I think it’s a good diversifier. A lot of times people use some of these in a single holding such as gold, it’s very popular. They try to use it as an inflation hedge. It’s a very volatile inflation hedge. But yeah, we believe that you should absolutely have some sort of this asset class in your portfolio. But yeah, no more than 5%. Exponential technology? I don’t know. If you have a globally diversified portfolio, you already own it. AC: You already have it. So we’re not big believers in trying to pick sectors. I think if you have a globally diversified portfolio, a low-cost portfolio, you’re going to have both of these in there already. JA: Right and so where, I guess, active management comes into play is that “we believe that certain sectors of the overall market will outperform, so let’s overweight or underweight particular areas.” We believe in that to some degree when it comes to the what types of stocks, potentially, you own, but not necessarily the sector. We look more in price and size versus do they specialize in a certain sector of the market. Natural resources is a very specific area of the market. And for you to say, “hey, maybe I overweight natural resources because I feel something’s going to happen in the future of the economy,” we believe that’s a guessing game and it’s very difficult to try to play that game. I’m not saying that’s impossible, it’s just difficult to time it correctly of when you overweight it and then when do you underweight it, or when do you get the normal weight back in any other area of the market. AC: Yeah and the problem with that Joe is that if you think it’s a really good time because of X Y and Z, probably other people think that too. And so the price may have already been bid up. And so that’s why it’s difficult because things are already priced into the market. 24:57 – How to Invest $50,000 in Cash? AC: Well Morgan, congratulations for maxing out your 403(b) and Roth IRA. So if you’re under 50 that’s $18,500 and it is $5,500 in the Roth IRA, so very good. So I guess I’ll take a stab here. I guess you’re asking that you have an extra $50,000 over and above what you happen to have inside your f403(b) and Roth IRA. JA: Well they’ve got cash of 50 grand outside of the accounts, how do I invest it? AC: Yeah. So the first thing you got to do is, you want to make sure you have an emergency fund, and we probably would say six months of living expenses. So let’s say your living expenses are $60,000 and you probably want to set $30,000 aside just for liquid emergencies. Keep it in cash or put it in a money market account. So if in that example, you’ve got $20,000 leftover, and then it depends upon what are your kind of short-term and mid-term goals? If this really is for retirement like you say, then you can have it more geared towards growth which would be more stocks over bonds, but maybe you’ve got a secondary goal like a down payment for a home or something like that – then it might be altogether different. JA: So $50,000 cash is retirement income. He or she, Morgan, has maximized all of their accounts. I would say this. Morgan, you’re already investing. You have a Roth IRA and you have a 403(b). I’m making the assumption that those are invested in some sort of investment vehicle versus cash. That it’s in the mutual fund of some sort. Just because it’s outside of a retirement account, you would invest it very similar to your retirement accounts. But I think sometimes it’s like, ” well I have this money outside of my retirement account. What do I do with it?” Well, you’re already an investor if you have a 403(b) and a Roth. You would do very similar. Just because it’s outside of a sheltered retirement account doesn’t necessarily mean anything. It’s a good diversifier that you will have from a tax perspective when you start taking distributions from the account out in 5, 10 years, whenever your retirement date is. So “here, I have this $50,000 cash, how do I invest it?” Well, how are you investing your other funds? So you probably want to follow a similar logic. Then we could get technical and talk about asset location, where you would want to have more, I guess, asset classes that have a higher expected rate of return outside of your retirement account. You might want to use exchange-traded funds versus mutual funds because those are more tax efficient, but I wouldn’t overthink this. You’ve got some cash, you want to invest it, you’ve already invested in a Roth, so that means you have a brokerage account somewhere. So just kind of look at it like that – I don’t think you’ve gotta over this thing. AC: Yeah I agree with that Joe. And I think a lot of times people will come to us and say, “I’ve got an extra $100,000 what should I do?” And it’s like you’ve got to look at the whole picture. And I think that’s what you’re getting at. JA: So yeah, you look at, you already are an investor, you have investments already. Just because it’s outside of a retirement account I wouldn’t overthink it. JA: All right. So we’ve got Rob from Hollywood. So “I’m listening to your show about planning for retirement without a pension. Here’s my scenario/question. I have a pension in the entertainment industry.” All right Rob. I wonder if there’s anything that we’ve seen? Entertainer? I wonder if he’s famous. AC: It could be. Rob from Hollywood. JA: “I have worries that it may not be there when I go to retire, or won’t be as much as they say. Regardless of that, since I have a pension under federal law I am not allowed to put money into a tax-deferred IRA and I make too much money to put into a Roth IRA.” OK we’ll come back to that. “I’m also leery of mutual funds as I know you can get taxed and lose money in a year where the mutual fund goes down but trades have been made inside the fund that were profitable. (Learned that on your show. )” So it could be a tax issue within the mutual fund. “So what can I do to put more money away and have it grow? To be sure that I have enough to retire if my pension goes bust, or just a put extra away, or just have more money in retirement?” By the way, I am not afraid of mutual funds or ETFs or stocks, as I have some. I also have an IRA valued around $200,000 and I’m not sure if I can survive the tax hit if I convert a portion of it to a Roth.” All right, Rob, there’s a lot of meat on that bone. AC: Yeah there is, we could do a show on this one. AC: I think what he’s saying that he can put money into an IRA, but he can’t get a tax deduction. So I think that’s what he’s trying to say. JA: So he can put money into an IRA, but he also makes too much money to put money into a Roth. He already has the IRA. So he can make a non-deductible IRA contribution as long as he’s under 70 and a half. JA: So we don’t know how old Rob is. You’re right. If you look to start building – and this is very similar to Morgan. “I have some extra money. How do I invest it?” Well yeah, you would want to continue to build a non-qualified brokerage account. And I think you’re right. I like ETFs better than mutual funds in a brokerage account because of the tax sensitivity of those particular investments. In an actively managed mutual fund, they’re buying and selling and trading. So even though the fund could lose value, there could be stocks within that mutual fund that the portfolio manager trades at a profit that would give you a tax bill even though you lost money in the overall fund. So, you might try some exchange-traded funds, index funds, things like that that have very little turnover so you won’t experience that tax bill. AC: Yeah and I agree with that. I think a lot of people don’t really understand when you have a mutual fund, ETF, index fund, there are two kinds of income that comes out of it – there are dividends. Those are the profits of the stocks that you hold. That’s going to come to you and usually, it’s quarterly, and there’s nothing much you can do about that unless you happen to pick maybe a diversified fund that doesn’t have high dividend paying stocks. I suppose you could do that. The other thing that happens, as you mention Joe, is the fund manager buying and selling stocks inside that portfolio. That’s a capital gain dividend, that often happens once a year towards the end of the year, and you have basically two kinds of funds: one where the manager is trying to buy stocks, pick them, sell them, buy, sell, buy, sell, and that causes a lot of capital gains dividends. Then there’s index funds and some, a lot, not all, ETFs are the same way to where you’re just getting a basket of stocks if you will. So there’s not a lot of activity. JA: You like to use the word dividend even though it might not be a dividend. JA: Yeah. So if they’re buying and selling that’s not necessarily a dividend. It’s a distribution. JA: Oh, see he’s technical with the actual 1099. 32:50 – What Should Your TSP Allocation be if You’re Retiring in 20 Years? JA: We got Leonardo Frederick from Maryland. JA: Oh. I have no Frederick, Maryland is but Leonardo from Frederick, Maryland Is that better. JA: OK. “Hello Mr. Joe.” Ooh I like it. AC: There you go. I’ll just sit back, it’s addressed to you. JA: ‘My name is Leonardo. I have a long question. I work for the U.S. Postal Service and I have my TSP Roth. I’m contributing 100% of it. I’m single. I claim my mother as a dependent. I have a house that I pay every month. I change my allocations like this: I put 40% in the C fund, 40% in the S fund, 20% on F fund. And that’s how it will be distributed every time I get paid. I can always change the percentage of each fund, the horizon that I set up was 20 year terms. I’m planning to retire in 18 to 20 years from now. I changed to want to avoid taxes in the future, but my employer contributes, matching 5%. That contribution goes straight into the traditional account. It is good, smart, best decision of what I’m doing? Please help me and advise me. Thank you so much for your wisdom and advice.” So Leonardo I wish I could help you out a lot more, bud, but I really can’t. AC: (laughs) Well let me try, then. JA: He’s got 20 years and I don’t know how much money he has, what his pension is going to be, how much money that he’s spending, is he married? Well, it looks like no he’s single, I’m sorry, I have that. So he’s asking if his allocation, so he’s got 40% in the C fund. 20% in the S fund and 20% in the F fund. AC: Right. So that’s 40% in C fund. So that’s like large company stock. S&P 500, common stock, and and the S fund is like smaller companies, small and medium-sized common stock, and F is like fixed income. So that’s roughly 80% stocks 20% bonds, for a retirement allocation, not needing it for 18 to 20 years, that could be all right. You’re right, we need to know a little bit more. But if it were two years out, it probably would be too aggressive. I think there’s one thing I might say about this one, and it’s all domestic stocks – he might want to do some international though. That would be the I Fund. Maybe take some out of the C fund, some out of the S fund and invest in the I Fund, then I think you’d have even a little bit more balance. But based upon what we know, Leonardo, I think you’re on the right track. AC: Yeah, maybe 20/20 between C and S, something like that. AC: Me neither. But I think you’re doing a lot of good things. AL: See, you had all kinds of good advice for him. JA: There ya go. But it’s difficult to say, “this is what I’m doing, is this good?” Because we don’t know anything. Just going blind here. AC: (laughs) Isn’t that what we always do? 36:18 – Can You Transfer Your 401(k) to Your Spouse’s Solo 401(k)? JA: All right. This is from Brian. He gives no location given so let’s pretend he’s from San Jose, California. Brian from San Jose, welcome to the program. AC: Those are notes from Andi. (laughs) We’re pretending now. AL: Well it’s nice right now. JA: “I will be leaving my employer and would like to know if I can transfer my 401(k), approximately $500,000 into my wife’s solo 401(k). My wife is a realtor and I participate in the business by maintaining the financial records, filing tax returns, etc. but unpaid – this can be changed if needed. I understand if a spouse participates in the business and is paid, they can contribute to the solo 401(k). Does this allow applying to roll over a 401(k). I’m age 56, plan to be in my new job for about five to 10 years and will probably join my wife in the real estate business after my employment. She is 55 years old. Another alternative is to transfer the 401(k) to my new employer and if I retire in service before 59.9 I can draw early without penalty. Our strategy includes backdoor Roth IRAs and her contributing to the solo Roth IRA. Where are my limits on my wife’s contributions including Roth IRA rollover, solo 401(k) and solo Roth IRA? We have sufficient funds to max out the Roth IRA where we can have her income and expenses of approximately 60 grand.” So Brian, to make this real simple, roll your 401(k) because he’s doing the back door Roth. So I get where he’s coming from. Yes, you can open up a 401(k) plan if you are a participant within the business, but you need to get paid. AC: You need to get paid. And he mentions that. So we agree with that. JA: But if you already have another employer, just roll it into that plan, that would still qualify you to do backdoor Roth IRAs. Alan, she makes 60 grand. How much money can she contribute to her solo 401(k)? AC: Well, assuming she’s under 50, $18,500 plus the profit sharing parts, probably, I’m going to say almost $20,000 bucks, something like that. Probably about $35,000 total. JA: So Brian, what you do is you would have her go to the solo Roth 401(k), and then the profit sharing would go pre-tax so you can get best of both worlds. JA: Hey, that’s it for us, hopefully, you enjoyed the show, hopefully, all of you had a wonderful Thanksgiving, there is a lot to be thankful for, we’ll see you next week. The show is called Your Money, Your Wealth®.